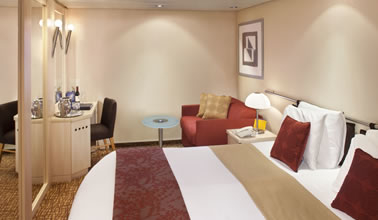 Details for Celebrity Constellation can be found below. 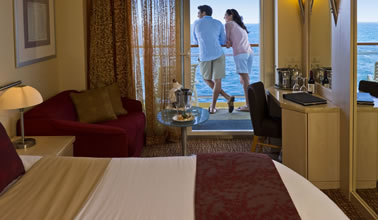 Note: Some cabins have a partially obstructed view. Personalized Concierge service. Priority check-in Exclusive embarkation day lunch. Destination Seminar. Exclusive pre-departure lounge. Priority debarkation. Main & specialty restaurant seating time preferences. Welcome sparkling wine and fresh fruit. Daily delivery of afternoon savories. Our signature, personalized service. Daily makeup and turndown service. 24-hour room service. Complimentary robe and tote bag. Celebrity eXhale™ bedding. Private mini-bar. Interactive Samsung flat-screen television. Private safe. Custom blended bath products. 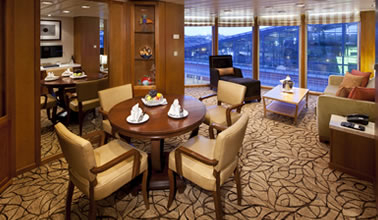 Stateroom: 204 sq ft. veranda 42 sq ft. 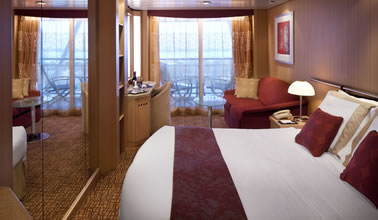 Note some C3 Concierge cabins have an Internal Balcony - Personalized Concierge service. Priority check-in Exclusive embarkation day lunch. Destination Seminar. Exclusive pre-departure lounge. Priority debarkation. Main & specialty restaurant seating time preferences. Welcome sparkling wine and fresh fruit. Daily delivery of afternoon savories. Our signature, personalized service. Daily makeup and turndown service. 24-hour room service. Complimentary robe and tote bag. Celebrity eXhale™ bedding. Private mini-bar. Interactive Samsung flat-screen television. Private safe. Custom blended bath products. 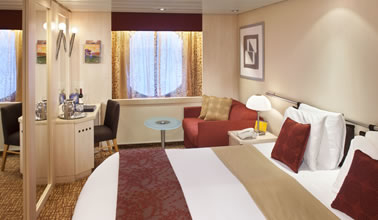 Stateroom: 204 sq ft. veranda 42 sq ft.
Celebrity Suites come complete with private bathroom, vanity area, hair-dryer, interactive TV, radio and phone. 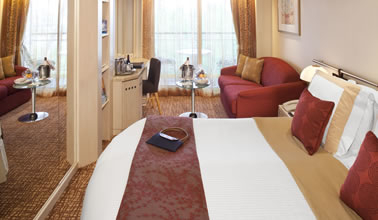 write a review of Celebrity Constellation.